Leading Manufacturer of stainless steel cylinder trolley, aluminum oxygen cylinder trolley and oxygen cylinder trolley from Pune. We have gathered a huge customer base in this domain by presenting a comprehensive range of stainless steel Cylinder Trolley. 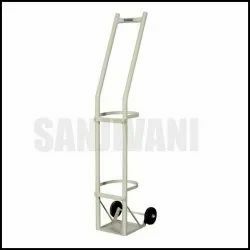 This trolley is developed using quality material and higher technologies. Our professionals opt for strict quality tests throughout the production of the trolley to guarantee optimum performance. The provided trolley is made accessible in different capacities. Push type with two castors 100 mm Dia. With phenomenal market understanding, we are able to introduce an extensive range of Aluminum Oxygen Cylinder Trolley. 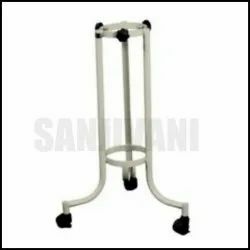 The offered trolley is developed in accordance with industry norms and using quality pretreated and epoxy powder coated materials. It has 60 mm x 30 mm CRCA tubular framework and four section perforated CRCA sheet on the top. Backed by our years of industry experience, we are betrothed in presenting an excellent quality of Oxygen Cylinder Trolley. The offered trolley is equipped with a backrest, knee rest, Trendelenburg, reverse Trendelenburg and height adjustment operated by screw and lever mechanism. Furthermore, it has a pair of new design collapsible side railings. 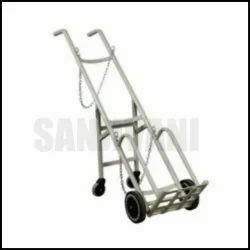 Clients looking for such trolley can get it from us at cost-effective rates.